Dr. Tariq Atiya is an Assistant Professor of Business Administration in the Management and Marketing Department, within College of Commerce and Business at Dhofar University. Dr. Tarig got his PH. D in Business Administration University of Juba, 2010, His MA: Local and Regional Development (LRD): Institute of Social Studies (ISS) in the Netherlands)with concentration ( sub-specialization): (a)Project Planning (PP), and (b) Human Resource Development and Employment Strategies (HRDES). 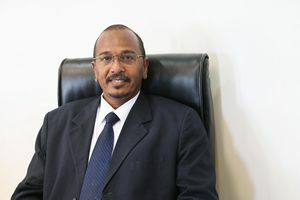 He has previously held academic teaching and senior administrative positions at the SUR University College, Sudan International University, and University of Juba. Previous university roles include Convener of MA program in management in CCBA, Chair of Business Administration Department in SUR University College, Deputy Director of School of Management Science at University of Juba, and Dean of Academic Affairs at Sudan International university. His teaching and research interests relate primarily to business administration namely the SMEs, TQM and family Business. Teaching methods/style: My teaching style can be described to be of a mixed style, depending on the situation. It may include: problem solving, critical thinking, reciprocal style among others.